If a client is paying you to renovate his or her home or office building, that means they’re looking to replace what they have with something better. It’s your job to inform your client of what’s actually ‘better’. Oftentimes, your clients don’t really know what they need until you present the better options to them. All they know is that they want a fresh new build, or their home or building is crumbling, or at best, just needs a new look and their only source of knowing what kind of building materials are out there might only be what’s getting advertised—which is a good thing because you know what to stock your warehouse with based on the demand, but you can’t always let the media dictate what kind of materials to build or improve your client’s build with. Your clients will come to you with what they think they want, but it’s not until they know exactly what’s available to them, will they be able to make an informed decision about what kind of materials they want in their build. Some of the more obvious finishing choices are selecting the type of flooring and tile they want, but what oftentimes gets overlooked are the alternatives. For example, in the city of Miami, what’s usually sets the tone for it’s glamorous, white-hot settings is the bright and light interior designs. This may have something to do with the minimal square footage that most homes on Miami Beach have and a lighter, brighter setting may make a smaller space appear larger. Also, there’s just something about the Bianco Dolomiti, a popular marble tile that screams “Miami”, so quite naturally, the Bianco Dolomiti is what most contractors in the South Florida area stock in their warehouse. If every builder in the South Florida area is stocking Bianco Dolomiti, don’t you think that over a period of time, someone’s is going to grow tired of that kind of design? It’s already happening! There are many businesses and homeowners who want to stay true to the Miami vibe in regards to design, but want to change it up a little bit. This is where you come in as a marble supplier and inform them of their options. 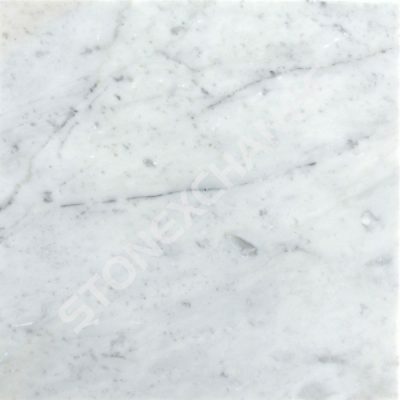 Bianco White Carrara has the same color properties as Bianco Dolomiti. It even cost the same per square footage as Dolomiti. So, if they cost the same, then why not just stick with what’s popular? One might argue that might be the wiser choice in terms of resale value. Bianco White Carrara’s surface has more fluidity in terms of the veining. It offers the hybrid look of classic stone, but the white background makes you stay true to the Miami theme. This is perfect if you’re looking to emulate a softer tone to a space. It blends in to both modern and classic projects and is complementary to office buildings and homes. Another great benefit to Bianco White Carrara’s marble tile is that the fluid veining offers a more relaxed tone, whereas the Bianco Dolomiti has straighter veining, giving off a more sleek and modern look, oftentimes favored for office settings. Because people may not have been aware that Bianco White Carrara is even an option, those that do have the advantage of making a cutting edge impact in the design market. It’s highly unlikely that you’ll see this brand of natural stone on TV as a featured selling point, possibly home improvement magazines, but television is going to be the most obvious selling point for people who are not as educated in the construction and renovation industry simply because the information is being spoon-fed to them and they’re not really digging deep enough to know what’s really available. This is where Nalboor Tiles, a manufacturer and wholesale distributor of marble natural stone can assist you. We service contractors, designers, and architects—businesses located all over the United States that are in need of a bulk supply of natural stone. Because we have access to quarries in over 10 countries, we have an unlimited supply of quality natural stone—Bianco White Carrara Marble Tile included. What this means for you is that you’ll never have to worry about running out of inventory. This is huge for companies that land contracts for multiple builds. By simply looking into The Next Miami, you’ll be able to see a long list of construction projects currently underway and that are slated. This information alone shows the amount of construction that goes on in the city of Miami. Think of how many of these projects are most likely installing Bianco Dolomiti and how many might be using Bianco White Carrara. How Much Does Bianco White Carrara Cost? The Bianco White Carrara costs $6.50 per square feet at 12 x 13 x 3/8 and $6.95 per square foot at 18 x 18 x 3/8. Order your free sample online right here. Please note that our sample pieces will not be in the dimensions we sell our tile in and is not for use. It’s also wise to keep in mind that when it comes to natural stone tile, the patterns come in variations, so you should not expect every tile to look identical. Please refer to Nalboor’s Bianco White Carrara page to see examples. Contact us today to order your bulk supply of Bianco White Carrara marble tiles as a discount price. Call us at 305-501-4548.